Flex and Stretch Ripples - Flex and stretch ripples allow the Closer to Nature teat to mimic the natural flex and movement of mum’s breast. Soft Silicone Teat - The soft silicone teat feels closer to skin and gently elongates and flexes during feeding to mimic a natural breastfeeding action. Breast Like Shape - The breast like shape of the Closer to Nature teat allows baby to latch on easily and further supports the transition between bottle and breast. Super Sensitive Easi-Vent Valve - The super sensitive Easi-Vent valve gives superior venting for easy feeding and less risk of baby taking in air. 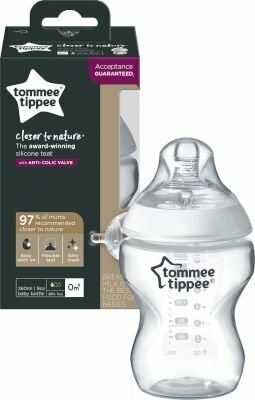 Compact Shape - Designed to be held in the most natural position during feeding, the compact shape of Closer to Nature bottles allows baby to be closer to you. BPA Free - For total reassurance, all of our products are free from Bisphenol A (BPA).